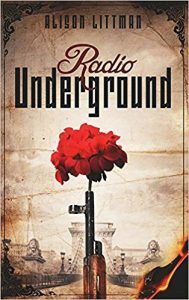 In my last blog piece, I reviewed Alison Littman’s debut novel, Radio Underground, the story of a mother and daughter whose lives become intertwined with a young man obsessed with rock ‘n’ roll and Radio Free Europe in Hungary during the Communist dictatorship. Intrigued by the novel and its path to publication, I tracked down the author and sent her interview questions on her research, writing process, and the relevance of this story set in the 1950s and 1960s for the present day. LML: Why did you decide to write about Hungary in the 1950s and 1960s? Do you have a family connection? I lived in Budapest for a while when I was in college, and fell in love with the city. When I returned to Berkeley, I had to write a senior thesis in order to graduate as a History major. I knew I wanted to write about Hungary, but since I wasn’t fluent in the language, I was in a bit of a bind. I went down to Stanford to take a look at their Radio Free Europe archives, since the organization was heavily involved in gathering intelligence on Eastern Europe during the Cold War. There I found these letters Hungarian teenagers wrote to a rock ‘n’ roll DJ for Radio Free Europe, Uncle Lanci, in the ’60s. In their letters, these young people requested songs — “Blowin’ in The Wind,” “Surfin’ Bird,” “I Want to Hold Your Hand” — and they also wrote about their lives and struggles they faced under such a repressive regime. Their words were so touching, I just couldn’t get them out of my head — and one day, after I graduated college, I sat down and started writing about them…from there Radio Underground was born. How did you choose the distinct narrative perspectives for your three protagonists Eszter, Dora, and Mike? 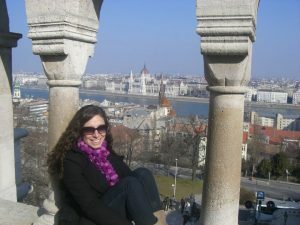 Alison Littman as a student in Budapest in 2009. Through Mike I tried to capture the voice and perspective of those young people who authored the letters I found. Eszter is so passionate — to the point of delusion, really — and I wanted her to be so focused on what was right in front of her, that she couldn’t really see the big picture, which is why I chose first person for her. Dora is more conventional, enjoys structure and, at first, is somewhat removed from her feelings. She works so hard to be the opposite of her mom, that her story can only be told through an opposite perspective, that of third person. Mike is based off the the letters I found written to Uncle Lanci in the ’60s. I found about 30-40 of them and they were originally written in English by non-native speakers or translated, causing the English to be a little, well, off, with this overly verbose syntax or not quite the right words being used. Also, the writers were sometimes so funny — I took those two aspects and exaggerated them for comedic effect for Mike’s character. The majority of these letters showed an ardent, fanatical love for The Beatles and expressed views on living under the communist regime. I remember one letter writer describing how they brought a radio to class and the second the teacher turned around, switched it to the illicit Radio Free Europe station to blast rock ‘n’ roll to the classroom. A lot of the letters included song dedications that Uncle Lanci would read over the radio with the author’s name — however, they always signed their letters with code names so they weren’t caught by the government for listening to the illegal radio station. In this way, these young people developed this friendship with Uncle Lanci and you can see that in their letters which are sometimes funny and other times sad, but always touching. A memorial to the 1956 uprising in Budapest. Photo by Alison Littman. With Mike’s character I really strove to capture the voices of the letter writers, and Mike was an actual letter writer himself. However, his character is an amalgamation of all the voices I found in those letters — as much as possible. Dora is loosely based on a Hungarian friend of mine, though only in the sense that I imagined this character looking like my friend. Her circumstances and personality are actually quite different. Eszter was made up completely, though I can relate to many aspects of her personality as I can be so determined to accomplish a goal that I forsake reality. Tell us about your journey to publication. How did you connect with Last Syllable Books? I connected with Last Syllable Books back in 2013 when Selene, the founder and also an author herself, and I were pitching our novels to the big publishers at a conference in New York. We formed a fast friendship and though I lived in San Francisco and she in New York, we started sharing writing with one another, as well as helping each other improve our current novels. 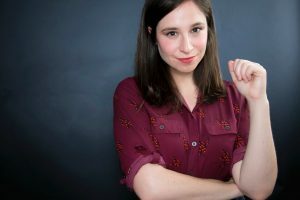 After a few years, Selene started up Last Syllable Books after landing a distribution deal with Independent Publishers Group, IPG, and offered to publish Radio Underground. It took about two and a half years from that initial offer to publication date — we went through multiple rounds of edits (I think at least four) and also collaborated on cover design, layout, and all those specific details required to bring a book to market. Who do you see as your readership for Radio Underground? 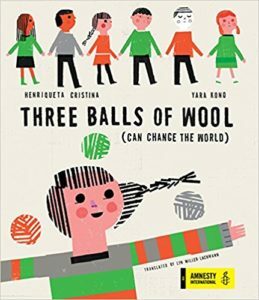 How does this historical story resonate today? I think my readership will first and foremost be people who want to learn about the world, particularly those fascinated by history. When I started out writing this story in 2011, I didn’t really see its relevance, but over the course of the past seven years, it’s become extremely relevant. In Cold War Hungary, news was used as a vehicle to manipulate the masses. Only the state radio was allowed on air, and people had to listen to other news sources in secret — like the BBC or Radio Free Europe. However, even those stations had an agenda (to promote democracy over communism). In fact, some accused Radio Free Europe of encouraging the Hungarian Revolution of 1956 to continue by suggesting Western aid would be forthcoming. 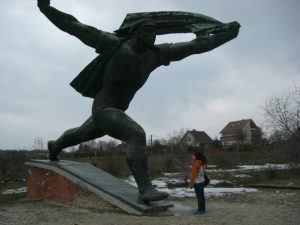 Western aid never arrived, and many Hungarians lost their lives battling the Soviets in ’56. Alison Littman. Photo by Katy Karns, used with permission. I think now, as a country and world, we are facing a similar dilemma — in which powerful leaders are directly influencing and shaping the news to further their political agendas, in a very aggressive and outright way. With social media on the rise, the tools to disseminate false and/or slanted information are so much greater than in Cold War Hungary. Recently, a Facebook group called Black Elevation was created, that—though its stated intent was to fight racism—was actually trying to create divisions and provoke backlash before the midterm elections in the United States. This fake group inspired real protests, rallies and events across the country. Though Facebook never revealed the origins of this fake group, similar groups were linked to Russia, and at this point, it’s common knowledge that Russia tampered with our election in 2016. This interference in our politics could be seen as eerily similar to what happened in Cold War Hungary. However, the difference is that in Cold War Hungary, the U.S. was influencing the news to encourage democracy over communism, whereas now, the main goal of fake news is to create rifts among us. One thing that is particularly concerning is that autocratic governments have wielded Facebook to spread rumors that have lead to real-world attacks on ethnic minorities, which has happened in Sri Lanka, Myanmar, and India. Now it seems even more lives are on the line when a country controls the media because misinformation can spread so rapidly. Radio Underground is your debut novel. What are you working on now? I am working on a novel that takes place in modern day San Francisco. It’s more speculative than it is historical but I am really enjoying imagining a different world as I imagined what it was like in Cold War Hungary.